Our soon-to-be-released spring magazine notes that 10 local athletes will compete in the U.S. Olympic Marathon Trials. It also mentions that one runner’s entry was still in limbo. Julia Roman-Duval, 33, of Columbia, Md., had run a personal best and trials-qualifying 2:40:55 at the California International Marathon — but as we went to press, she was still waiting to hear whether or not she would be allowed to compete. Good news: Roman-Duval is in. The backstory is that Roman-Duval, native to France and a permanent United States resident for five years, needed one of two things to happen to compete in the trials. She either had to gain citizenship before the race or the USATF had to be satisfied that her citizenship would be granted before the Olympics in August. At this point it looks like Roman-Duval will have both scenarios working in her favor, though it was a long, tense ride to get there. She had applied for citizenship in July and, through her own homework, determined that the United States Citizenship and Services’ office in Baltimore would not process her application until March. Too late. Next she turned to the USATF. But as of last week, no decision had been made, and Roman-Duval said that a USATF staff member had cautioned her not to get her hopes up. It was not likely she would be allowed to compete, she said she was told, unless her naturalization interview was scheduled before the trials. Imagine training your heart out for a dream race that might not happen. On Saturday morning, Roman-Duval, physically able but mentally exhausted from all of the uncertainty, set out for her last long run still wondering if it was all for naught. That afternoon, though, she went to the mailbox one more time and found her answer. It was none other than a letter from U.S. Rep. Elijah Cummings (D-Md.) containing the good word that his staff had successfully expedited her naturalization interview. The interview will happen this Friday, eight days before the trials. Thus, on Friday, Roman-Duval expects to both gain her citizenship and, at the very least, could present impending proof of citizenship to USATF. With that, early this week, Roman-Duval heard from USATF’s Jim Estes that she was in. Roman-Duval has resided in the United States since 2006. She and her husband, who is a U.S. citizen, have three children, and as an astrophysicist, Roman-Duval is part of a team that contributes to the success of the Hubble Space Telescope. A triathlete who did not run in high school or college, she achieved solid marathon results off running just 12 miles a week. Based on that, her Howard County Striders teammates convinced her to gradually increase her mileage and intensity so she could take a shot at the trials standard. “I still can’t believe it,” she said. 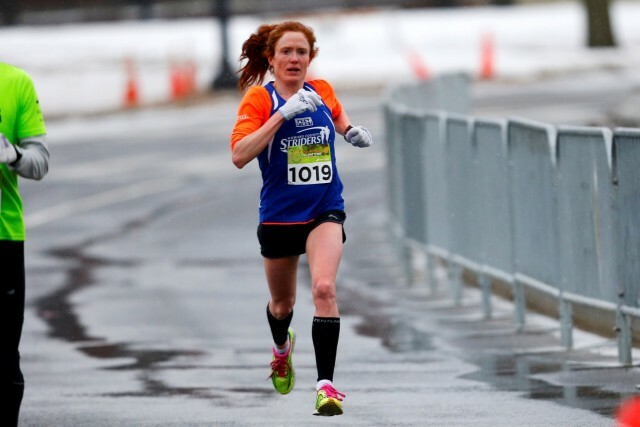 “It has been such a long and hard struggle to make this dream come true before the deadline,” from trimming 20 minutes off her marathon personal best to finally gaining eligibility. “My family” — including her husband, Miguel Roman — “is very excited and proud,” she said. When she told her youngest children, 3 and 4, about the news, they “listened, nodded, and moved on with their activities.” Her oldest, who is six, is anxious knowing she will be away from home for a few days, but has nonetheless been sharing the news at school. Her Striders teammates are relieved too. In 2000, McLean resident and fellow native of France Philipe Rolly was not as lucky. As a permanent resident, he was forced to sit out of that year’s trials and never ran the standard again. The Baltimore running scene will also be represented by Andy Weaver and former resident Christine Ramsey.